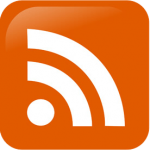 There are reviews where it is easy to be objective, because you have no vested interest in the subject matter. Then there are reviews where it is almost impossible to divest yourself from the product in front of you, because the subject matter holds a special place in your heart. This review definitely falls into the latter category, as I am a MASSIVE fan of Jim Butchers’ “The Dresden Files” series of novels, which chronicles the adventures of Harry Dresden, Wizard For Hire, as he solves cases, and tries to keep The City of Chicago safe from all manner of mortal, and supernatural threats. The New York Times bestselling series has spawned 15 novels, a series of graphic novels, a short lived, but criminally underrated T.V. 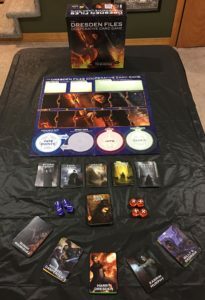 show, an absolutely FANTASTIC tabletop RPG utilizing the FATE engine (Which I may review in a future article, even though it’s been out for 7 years), and finally the subject of this review, the aforementioned card game. 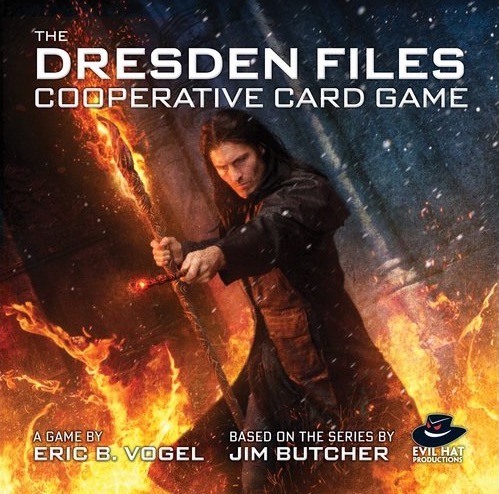 The Dresden Files Cooperative Card Game (TFCO from here on out) is, as the title states, a cooperative card game for 1-5 players, where the players assume the roles of the titular character, and an assortment of his long time allies, to solve cases, and defeat enemies. Players begin the game by selecting from one of the five included “book decks”, all of which reference one of Harry’s case files, or generate a random scenario from the Side Jobs deck, which is also included. Players will then select which character the wish to play. It is worth mentioning that each of the characters have their own special talent, which is useable every time the game conditions are met, and a stunt, which is useable once per game. Without boring too many of you with the nut and bolt mechanics of how to play, allow me to reference Evil Hats most excellent how to play video at evilhat.com/home/dfco-learn-to-play/. Evil Hat even includes a handy QR code on the side of the box, which you can scan with your smartphone or tablet, and it will take you directly to the video!! TFCO comes with 5 book decks, the “create your own adventure” Side jobs deck, and 5 character decks. Game setup, and ready to play, note the FATE points (the blue chips on the left hand side) these are the shared pool of points that your team will be using. 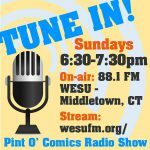 TFCO utilizes a shared pool of points, called FATE points, which is a reference to Evil Hats OTHER top notch Dresden Files product. These FATE points are what power the various action cards that the players have at their disposal: attack cards, which are used to add hits to enemies, investigate cards, which will add clues to investigations, overcome cards remove game restricting obstacles, and take advantage cards allow players to use in game advantages. The players cards can, and MUST also be used to generate FATE points, and it is this constant balance of expending, and generating FATE, which is the heart of the games cooperative mechanics. The end result of all this, is to solve more of the investigation cards by games end, than there are enemies left on the board. The Players can make the game easier, or harder by adding or subtracting FATE points at the start of the game, for example: starting the game with the maximum of 13 FATE points will make the game much easier than starting with only 8 FATE points. A typical starting hand for a 4 player game, note the FATE point cost of each card (the blue circles on the cards) these inform you as to not only the cost of the card in points, but also how much FATE you can generate if you discard it. My test group played five consecutive games, utilizing each of the pre generated book decks, all five decks were very well balanced, none proved any more difficult than the others, provided we used the same amount of FATE points, for our first game we used 13, and, after we got comfortable with the mechanics, dropped it down to 8 for each subsequent play through, which did provide a significantly higher challenge. Team communication became key, as you have to plan your groups moves at least 1 whole turn order in advance, the rules “forbid” showing the other players the cards in your hand, or discussing actual FATE point cost, so doing advance math can be difficult, but within those restrictions you can definitely determine whom will be attacking, investigating, and generating FATE points well in advance, and some of the games became a harrowing excercise in resource management, often coming down to the wire, or a lucky dice roll. 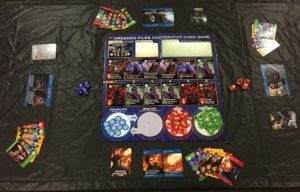 The designers did a great job making sure that book decks will more than likely never get stale, as no two games will ever play out the same, due to the variables in available FATE points, and with 10 more novels for them to create book decks from, I’m sure the now ubiquitous board game expansions, will be available soon. TFCO is a fantastic game, one that requires ACTUAL teamwork to be successful. I can’t tell you how much fun we all had at the table, and even got into some heated discussions as the games came down to the wire. It’s rare, the board game that gets you arguing with each other, but in a constructive way, and the eventual relief when not only the cards, but the dice go your way. There was a definite sense of accomplishment, when we pulled out a victory or two from the jaws of defeat, and we even experienced the anguish of choking a sure fire win, when we misplayed our hands, and trusted the dice, hey, we got overconfident, it happens, and the game taught us our lesson, which only proves that when dice are involved, there are no sure things. The Dresden Files is available from Evil Hat’s website, www.evilhat.com, and the MSRP is $39.99.